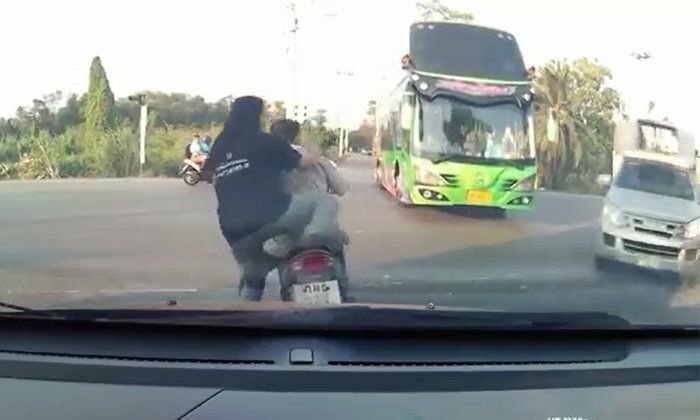 Dash cam footage from an intersection on Route 4056 in Krathum Baen, Samut Sakhon showed what happened when a green bus started edging across the road. A pick-up arrived at speed and the driver lost control and slammed into a motorcycle and passenger. They were reportedly both injured in the incident last Friday. Chanchai Sawangchang who posted the video on Facebook said the bus left the scene at speed. The accident caused much online comment with both the bus and the pick-up being blamed. But at the very least, posters said, the bus should have stayed at the scene. Police are investigating, reported Sanook. Yes it happens often, because they're driving a large vehicle and think everybody should stop and let them pass. We have 2 blaming the pick-up so far. I want to join them to make it 3-0. The bus is not completely without blame but we can't have fractions only whole numbers so the finger points at the pick-up driver. Avoidable collision. Very unlucky for the two on the motorcycle. The side street traffic yields to main road traffic; that's usually how it works. The bus was supposed to yield to oncoming traffic. That means WAIT until the oncoming traffic has cleared until proceeding. That said, the pickup may have been going a bit fast. Could he have avoided the situation if he considered slowing down a bit? Maybe. What was more disgusting is that the bus just drove off and did not offer any assistance. Although I could understand that for the driver's own safety, confrontation may not be the best option. 4-0 pickup. How can the driver have missed a slow-moving, bright green bus already 80% across the road in broad daylight unless he was playing with something? The bus did nothing wrong, no impact and was right to drive away. I did the same when a pair of silly buggers on a PX decided too late that they couldn't shoot the gap in front of me crossing the road slowly in front of them, then laid the bike down and slid gracefully, no-contact, underneath my back bumper before slamming into a light pole. Some days you're the windshield and some days you're the bug. 13 seconds from the time the bus moved forward till impact. You must be bloody joking. What the heck was the driver doing all this time? The only innocent party is the scooter driver, the pickup should have hit the bus. The bus was barging his way across. Taking a, "I am big, you should all have to stop for me" even if you have the right of way. I see it all the time on my scooter. Big has the right of way. end of story. 100% the bus drivers fault. The problem is the truck driver through his inattention or failing to realize the bus was bigger and would take the right of way kept coming across instead of waiting for the traffic to pass. The bus was supposed to yield to oncoming traffic. That means WAIT until the oncoming traffic has cleared until proceeding. Don't think he "missed" the bus but assumed it would wait until the road was clear but the bus driver didn't. 80% across the road? Hope you don't drive on the roads?